The Augmedics xvision-spine (XVS) augmented-reality surgical navigation system. YOKNEAM, Israel--(BUSINESS WIRE)--Augmedics, a developer of an augmented-reality (AR) surgical navigation system, has successfully completed its second cadaver study using its xvision-spine system (XVS) with surgeons from Johns Hopkins Hospital, as well as two surgeons from hospitals in Israel. During the study, the surgeons placed 120 pedicle screws in five separate cadavers with screw placement accuracy of 96.7 percent when employing the combined Heary-Gertzbein grading scheme. Augmedics’ xvision-spine system (XVS) is an AR surgical navigation system designed to give surgeons “X-ray vision” during complex procedures. With XVS, surgeons can see and navigate inside a patient’s body through skin and tissue, for easier, faster and safer surgeries. The XVS system comprises a transparent near-eye-display headset and has all elements of traditional navigation systems. It accurately determines the position of surgical tools, in real-time, and superimposes them on patient's CT data. The navigation data is then projected onto the surgeons' retina using the transparent near-eye-display headset, allowing surgeons to simultaneously look at their patient and see the navigation data without averting their eyes to a remote screen. XVS has the potential for use in many procedures, with its first intended use in minimally invasive or open spine surgeries. 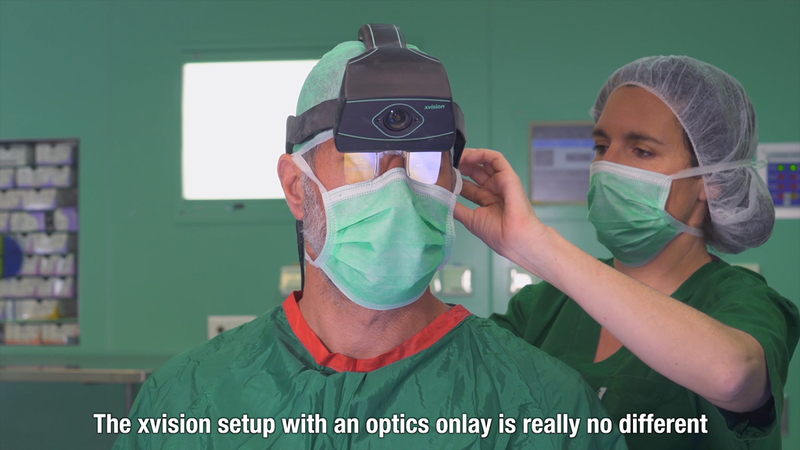 XVS uses patented see-through optics to project a 3D image of a patient's spine, as well as axial and sagittal planes, onto a surgeon's retina, in real-time, with surgical precision and outstanding depth perception. The technology was designed to save time during surgery, increase precision in MISS and open spine surgeries, reduce radiation exposure, and reduce the number of unnecessary repeat operations and hospitalizations. Dr. Timothy Witham, professor of neurological surgery and orthopaedic surgery at the Johns Hopkins University School of Medicine, said, “Typically what we have to do during minimally-invasive spine surgery is we have to look away from where we’re working. But xvision has all the image-guided information directly in front of you in the goggles you’re wearing, while you’re placing the instrumentation. During the study, 120 pedicle screws were inserted in five different cadavers at spinal levels L5-T6 using the XVS system. The procedures were performed by four trained spine surgeons, including two surgeons from Johns Hopkins Hospital, one surgeon from Sheba Tel-Hashomer, Israel, and one from Assaf Harofeh, Israel. It was conducted at Vista Labs, an independent lab in Baltimore, MD. The objective of the study was to assess the comparative accuracy of augmented reality (AR) assisted pedicle screw insertion in comparison to conventional pedicle screw insertion methods. Post procedural computed tomography (CT) scans were obtained and screw accuracy was graded using the Gertzbein score (GS) and combined Heary-Gerzbein grading schemes (HGS) by two independent neuroradiologists. Overall screw placement accuracy was 96.7% and 94.6% when employing HGS and GS grading respectively. Usability was evaluated using a User Experience Questionnaire (UEQ), comprised of 26 questions, which was completed by the surgeons at the end of the procedures. In terms of usability, the surgeons rated XVS as excellent for both classical usability aspects (efficiency, perspicuity, dependability), and user experience aspects (originality, stimulation). Founded in 2014, Augmedics seeks to improve healthcare by developing cutting edge technologies that will revolutionize surgical treatment. The company’s first product, xvision-spine (XVS) system, is an augmented reality surgical navigation system designed to allow surgeons to see and navigate inside a patient’s body during complex procedures. The XVS system, with XVS Software, has the intended use to precisely locate anatomical structures in either open or percutaneous neurosurgical and orthopedic procedures. Their use is indicated for any medical condition in which the use of stereotactic surgery may be appropriate, and where reference to a rigid anatomical structure, such as the spine or pelvis, can be identified relative to images of the anatomy. This can include spinal implant procedures such as pedicle screw placement, Iliosacral screw placement or interbody device placement. Augmedics has successfully completed its second cadaver study using its xvision-spine (XVS) augmented-reality surgical navigation system.